Sadly, André passed away on 13 August 2008. Our sincerest condolences go to his wife and family. Phenomenal!!! 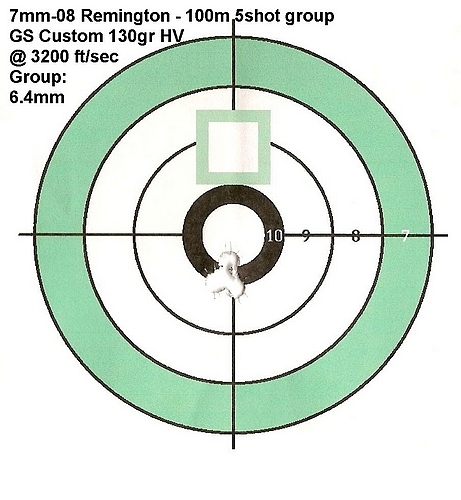 Only Xxxxxx 168gr Xxxxx Xxxx in .284 @ 2600 ft/sec can match the accuracy of your 130gr HV bullets @ 3200 ft/sec. The advantages of your bullet design is that, over and above phenomenal accuracy, it can be used effectively for hunting, even on large game, while Xxxxxx is far too "soft" for hunting. Out to 400 meters the HV performs the same with laser-like trajectory while bullet drop compensation with Xxxxxx becomes a real issue. I rest my case - the target speaks for itself. Thanks. They say there is always a first in everything - right? 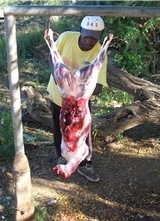 Well, during June 2007, I went hunting on our family farm and was asked to shoot a Springbuck for my cousin. I "walked and stalked" the herd and came to within 100m from them. There was no chance of a clear shot, as they were all bundled together bar one, standing off to the right, looking away from me at an angle. I aimed at the back as I could not see the neck and head - also to test the penetration of your bullets - and let fly with my .284, 7mm 130gr HV bullet, traveling at 3200ft/sec. The shot went a little higher than what I anticipated as I had no rest (tree or bush) and was standing on a slope, shooting off-hand. The effect caught me by surprise, as it was devastating. 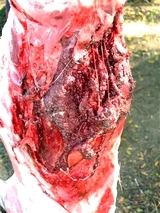 Bone fragments went flying everywhere causing secondary wound channels, leaving a nasty big wound. What amazed me was that even with such devastation there was very little meat bruising. 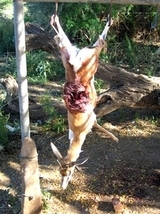 All the other animals I shot with the same load/bullet combination were at longer distances with excellent results. Attached are a few photo's of this experience. Thanks, you guys. Since using your bullets every hunting trip brings that old stirring of big excitement and anticipation to the boil from deep within. 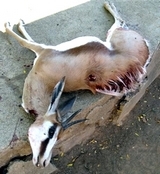 Below is a picture of a shoulder shot taken at a Grey Reedbuck at only 80m. I used a 130gr HV at 3200fps. 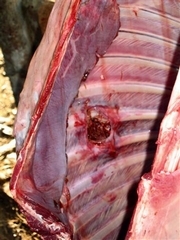 The bullet perforated the animal and could obviously not be retrieved, but a relief - and obvious to everyone, was the lack of meat damage - and the buck was stopped in its tracks. Thank you, GS Custom.